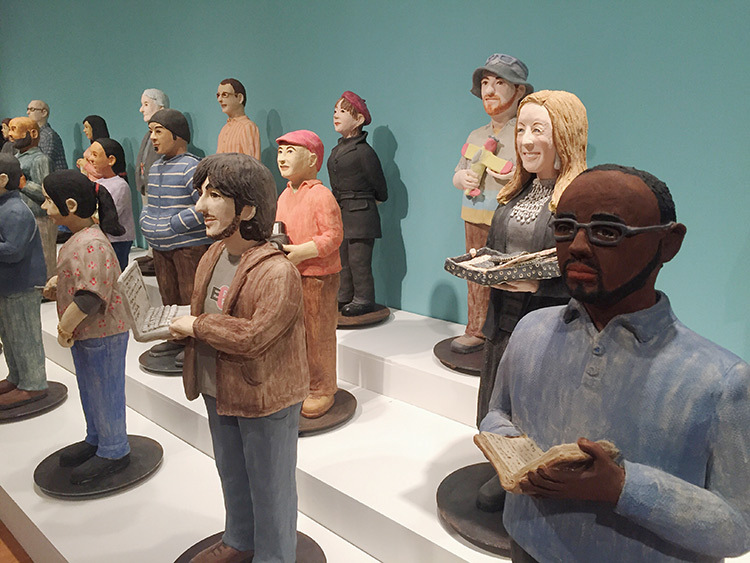 The Internet has been sculpted in clay, and it’s on display in Los Angeles. 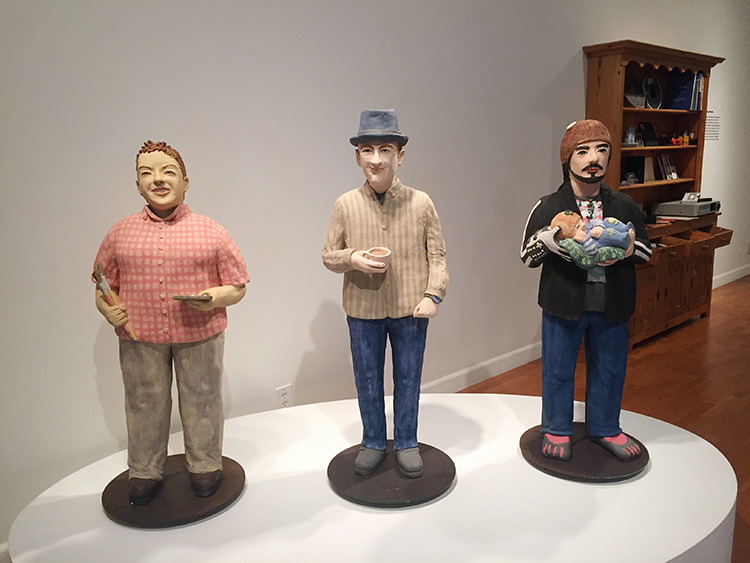 The exhibition From Clay to the Cloud: The Internet Archive and Our Digital Legacy features 32 sculptures of Web workers arrayed terracotta-warrior style inside the Laband Art Gallery at Loyola Marymount University. 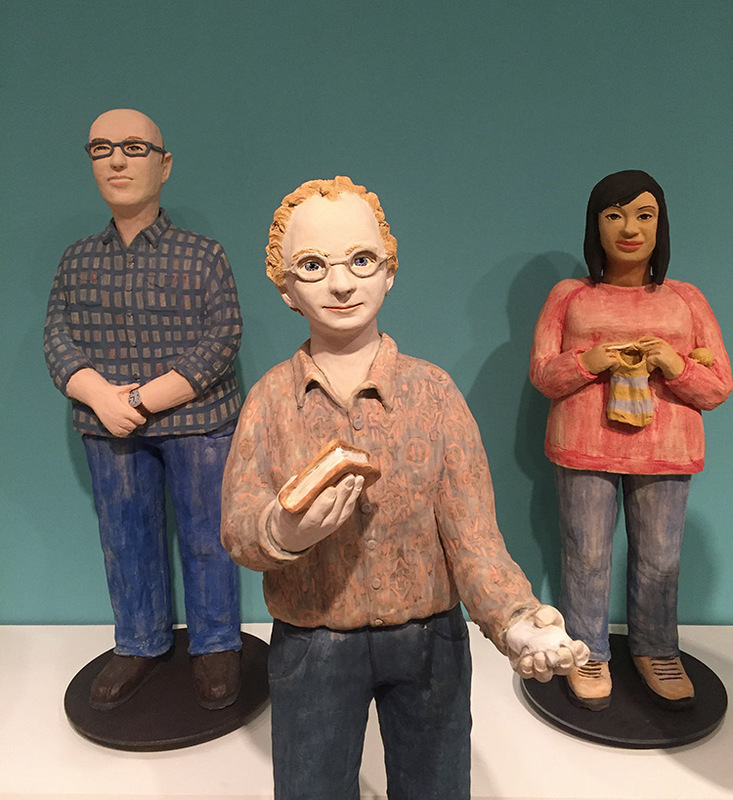 Created by ceramic artist Nuala Creed, the portraits depict staff of the Internet Archive and were commissioned by its founder, engineer and Web activist Brewster Kahle. You’ve probably been to the Internet Archive even if you didn’t realize it: the site receives over two million visitors a day. It’s a free digital library that preserves millions of texts, audios, movies, software programs, and other media, and its Wayback Machine holds a copy of the Web going back to 1996. The Archive also partners with over 400 libraries—including the Getty Research Institute, which houses the Getty’s vast art library and currently uses the services of six Internet Archive book scanners—to digitize public-domain books. The Archive’s goal, Kahle said at the opening for From Clay to the Cloud, is “to one-up the Greeks” by building a new Library of Alexandria dedicated to universal access to knowledge. To prove the Web’s thingness, Kahle is fond of saying that it weighs 26,000 pounds—the mass of a data center housed in a shipping container, which in 2009 held the entire Wayback Machine. He also likes to invite people to visit the Internet Archive in San Francisco, where anyone is welcome to see and touch the machines that make the Internet. Kahle is passionate about helping people understand that the Internet is made by, and for, human beings. 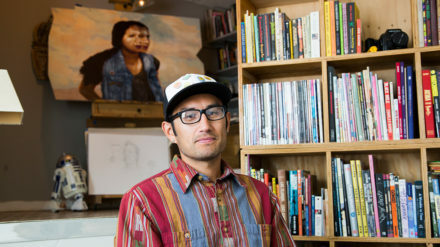 “On our screens we see no one else but ourselves,” he pointed out, but “what makes all this work is people.” Kahle’s love for people is obvious the second you meet him; he’s an incredibly warm, enthusiastic guy. When I told him I worked at the Getty, he gave me a hug. The clay sculptures depict this human dimension of the Web. Kahle got the idea for turning his own colleagues into art when he saw China’s famous terracotta warriors. Why not honor the soldiers of the Internet in a similar way? 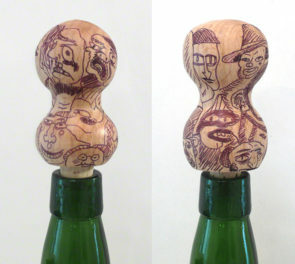 Kahle asked artist Nuala Creed, who turned the idea down as crazy but eventually agreed to try “one or two.” By January 2016 Creed had made 113 of them, 32 of which traveled to L.A. for the exhibition. Today all Internet Archive employees are eligible to be sculpted in clay after three years of service. Sixty-three of these half-height archivists, alongside eight of their human models, were choreographed and beautifully photographed for the book The Human Face of Big Data, which explores how always-on tech is transforming our lives. 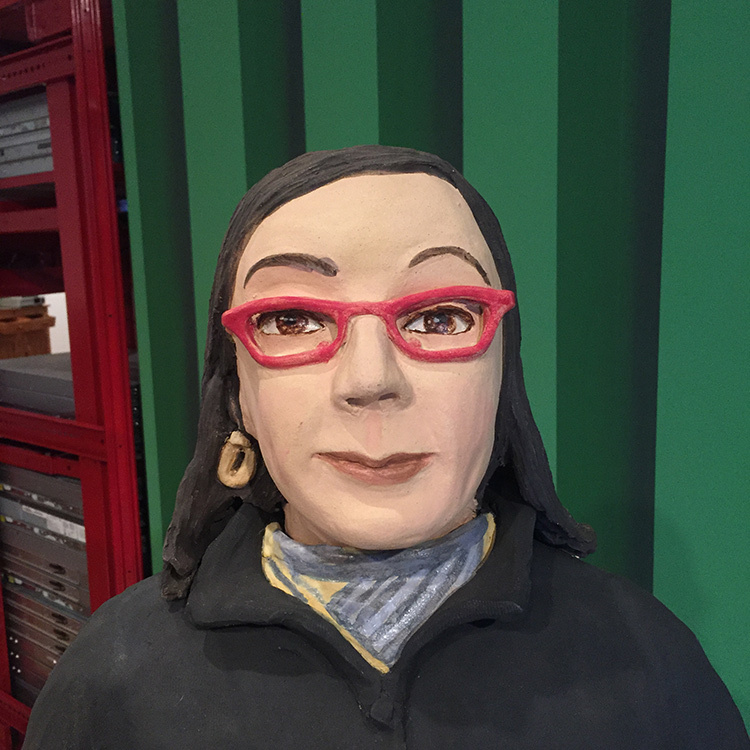 To create the clay archivists, Creed starts with full-length photos and a close-up of each subject’s face. 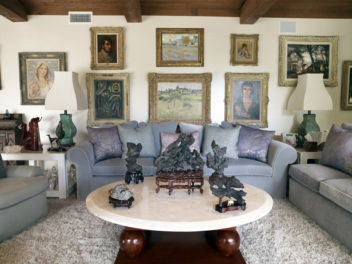 She works from the feet up, building each 40- to 50-pound, four-foot figure in sections over the course of several weeks using traditional methods of pinching and coiling. 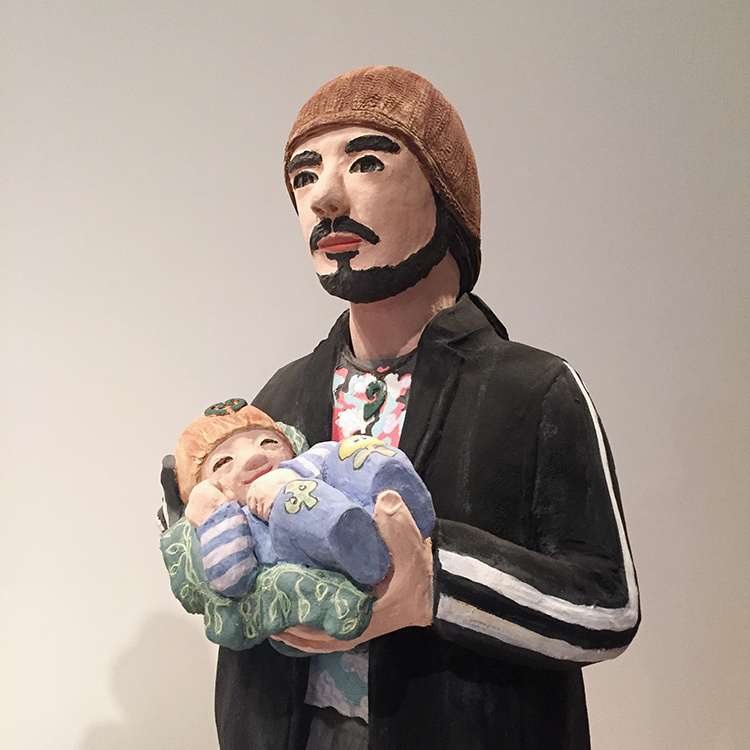 As she sculpts, Creed develops a friendship with her subjects, sometimes giving them a symbolic object to hold—ice skates, a mandolin, a map, a baby. The clay figure of Aaron Swartz, the Internet activist who committed suicide in 2013, holds a laptop and proudly bears logos of Creative Commons and the Electronic Frontier Foundation. The exhibition is poignant, fabulously nerdy, and thought-provoking. If you’re in L.A.—go! 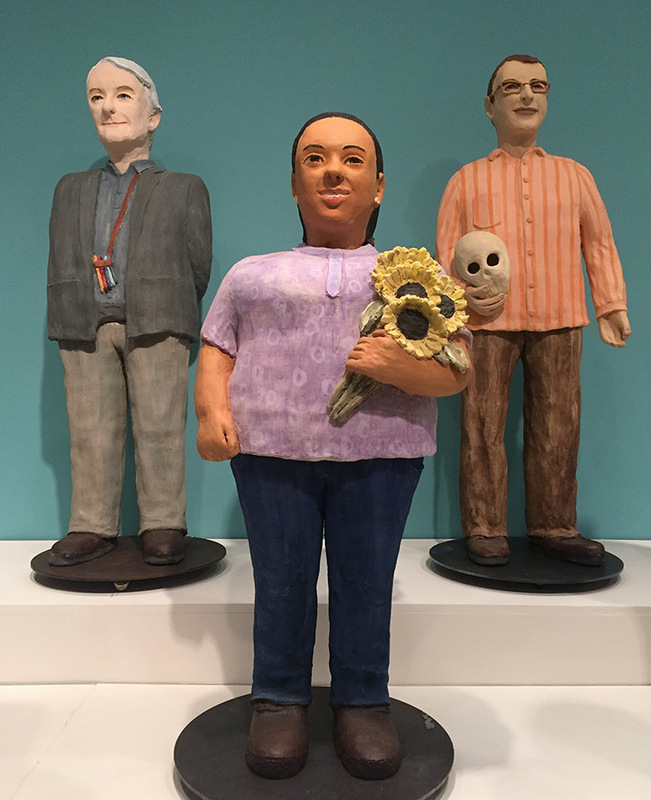 From Clay to the Cloud: The Internet Archive and Our Digital Legacy is on view at the Laband Art Gallery at Loyola Marymount University through March 20. Admission is free. You can also see the clay archivists in their natural habitat at the Internet Archive in San Francisco. The documentary film is (of course!) posted on the Internet Archive, and you can watch it here.